The on-line registration will be available March 24 - go on-line and sign up early to get the best seats at the banquet, luncheon and breakfast on this website. 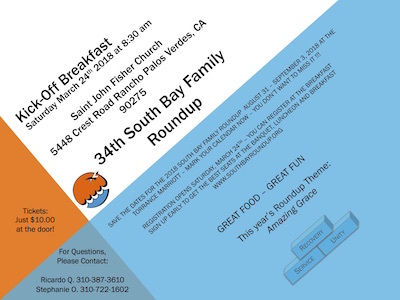 Be sure and save the dates for the 2018 South Bay Family Roundup - this year the Round Up will be held on August 31 - September 3, 2018 at the Torrance Marriott - mark your calendar now - you don't want to miss it!! Come and be a part of all the fun! © 2019 SouthBay RoundUp, inc. All rights reserved.